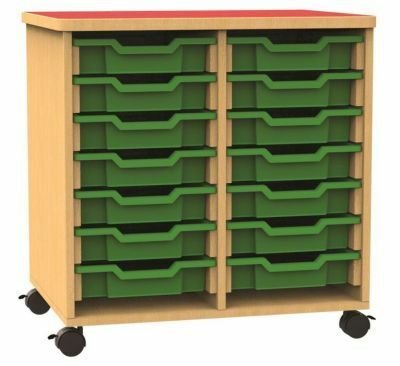 Open fronted double mobile storage unit with 14 Gratnell shallow trays, available in a wide range of colours, and braked castors. It's 18mm MDF carcass is a solid and durable construction making it the perfect unit for any high traffic areas such as classrooms and LRC's. Delivered assembles, free, to mainland UK. 10-15 day lead time. Double bay storage with 14 shallow Gratnell trays and large chunky castors. Trays sit on MDF runners. Comes assembled and ready to use. Delivered in 10 -15 days.